Each time you click Submit in the Calendar section, you are creating a new calendar, thus breaking the link to your previous calendar. 3. Select the appropriate link and complete any information requested on the pop-up screens that follow. Show the following dates on my calendar - Dates can also be added to your calendar based on the settings you choose in this section. You can elect to display Expected COE, MLS COE, Listing Expiration, MLS Expiration, Scheduled Buyer Inspection, Eviction Court Date, Personal Property Expiration, Personal Property Scheduled Removal, Inspection Contigency Date, Contingency Removal Date, Earnet Deposit Due Date, or Appraisal Scheduled Date. 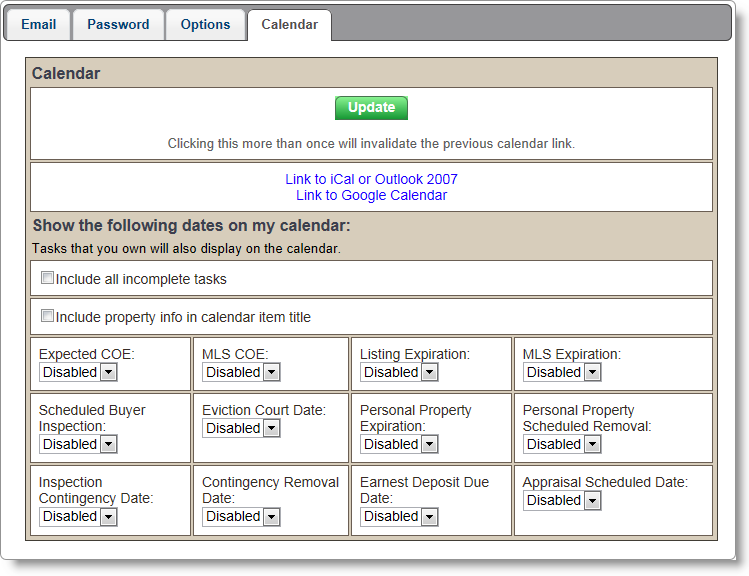 Dates will only be displayed for properties that are not in an archived status. 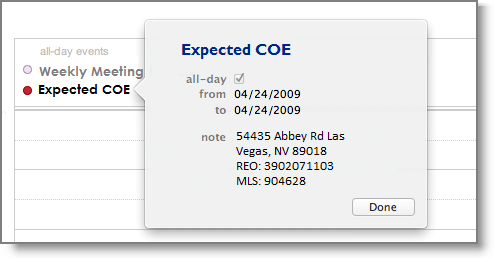 If you select Mine for any of the dates, it will only display dates for properties that you are the assigned agent for. Choosing All will display the dates for all properties that you have the privilege to view that are not in an archived status. Disabled will not show these dates on your calendar. Include all incomplete tasks - This check box applies to Task Power Users only. Checking this box will have the effect of showing all outstanding tasks, whether assigned to you or not.